This report examines the recent evolution of some specific flexible employment contractual arrangements in the EU Member States and Norway. Within the broader category of ‘non-standard forms of work’, the overview focuses on the ‘very atypical’ forms of work, namely: part-time work of fewer than 10 hours a week, very short fixed-term contracts, zero hours working and non-written contracts. Despite the difficulty in obtaining data, the study highlights the increase in the use of these different types of contractual arrangements and the sectoral specificities that exist Europe wide. The study explores actions which seek to guarantee both flexibility and security in the labour market through a degree of regulation and monitoring of these forms of work. The use of very atypical work raises particular challenges, especially in terms of health and safety,the risk of poverty and the propensity for undeclared work. Social partners as well as policymakers still have to address these challenges. Within the European labour markets, there has been a growing emergence of so-called ‘more flexible forms of work’, which deviate from ‘standard’ employment contracts. The need for flexible employment arrangements has been underlined on several occasions. Developing these forms of work is considered necessary for achieving economic growth through the adaptation of business strategies and productivity to globalised markets and economies. The existence and development of different forms of work have been repeatedly acknowledged by the European institutions. In its Green Paper on modernising labour law of November 2006, the European Commission noted that: ‘Rapid technological progress as well as globalisation have fundamentally changed European labour markets. Fixed-term contracts, part-time work, on-call and zero hours contracts, hiring through temporary employment agencies and freelance contracts have become an established feature of the European labour market, accounting for 25% of the workforce’ (European Commission, 2006). As the Lisbon strategy illustrates, Europe’s achievement of the labour market targets fixed in 2000 and revised in 2005 relied on developing forms of ‘atypical or non-standard’ work arrangements that allow ‘for more flexibility, either internal or external quantitative flexibility. Non-standard forms of employment allow for adapting hours of work, organisation of working time and the responsiveness of work to fluctuations in the demand for production or services’ (the so-called ‘Wilthagen matrix’ – Wilthagen and Tros, 2004). On the other hand, as these forms of work have only developed in more recent times, some adjustments of the rights and protection of workers are needed to adapt to these ‘new’ situations. In fact, the majority of workers’ rights and protection have been built around so-called ‘standard’ employment relationships – the main features being the permanence of a contractual relationship between the worker and an employer, with rights and protection being developed along the way. Some of the principal characteristics of work – such as pay increases, participation in the representative process, unemployment subsidies and pension rights – are linked to employment tenure. Moreover, new flexible pay schemes and vocational training systems also appear to be linked to job tenure. The so-called ‘standard’ employment arrangements are considered as ensuring employment tenure and therefore guaranteeing the whole range of rights and protection linked to this form of employment. Therefore, as the European Commission recognised, a prominent issue relating to the evolution of work forms is balancing flexibility and security. This issue involves ‘the need to look more closely at the regulation of temporary agency work; the need to combat the informal economy; the need to improve the interface between labour market and social security regulation, in order to smooth transitions between jobs; and the need to clarify the rights and responsibilities of the parties involved in subcontracting, in order to ensure that workers are not deprived of their employment rights’ (European Commission, 2006). In its communication entitled Towards common principles of flexicurity: More and better jobs through flexibility and security (84Kb PDF), of June 2007, the European Commission has set a number of objectives regarding the European labour markets. In particular, it highlights that ‘adaptation requires a more flexible labour market combined with levels of security that address simultaneously the new needs of employers and employees’ (European Commission, 2007). The risk of a polarisation of labour markets – involving, on the one hand, secure contractual arrangements under ‘standard’ contracts and, on the other hand, ‘precarious situations’ in ‘non-standard/atypical’ forms of employment – is under scrutiny. As the European Commission emphasises: ‘there is a growing gap between those looking for work, those in non-standard, sometimes precarious contractual arrangements on the one hand (so-called “outsiders”), and those in permanent, full-time jobs on the other (the “insiders”)’ (European Commission, 2006). It is worth mentioning that besides the formal economy, informal work arrangements are still in use given the interests at stake. Some employers use informal work arrangements to benefit in the short term – for example, from lower costs due to the non-payment of social contributions and taxes, and from access to a more flexible and adaptable workforce, allowing for a tailored organisation of work. These practices lead to complaints of unfair competition among many employers and employer organisations. On the other hand, workers can sometimes see undeclared work as a way to obtain higher incomes, which are not subject to social contributions and tax deductions. For other workers, it may be their only way of getting an income, as they would not otherwise be able to enter the labour market – a situation which is the reality for many immigrants, for example. Various trade unions have been vociferous in denouncing these illegal practices. The starting point of this report is therefore to assess differentiations between various categories of ‘non-standard or atypical’ forms of employment arrangements. The current state of play goes beyond a simplistic dichotomy between permanent or full-time contracts and non-standard or atypical contractual arrangements. Firstly, an open-ended contract no longer ensures a guarantee of job security – various crises show that even the ‘secure’ permanent contract can be threatened, due in particular to the processes of globalisation and the ‘financialisation’ of the economy, leading to considerable company restructuring. Secondly, non-standard employment contract arrangements canbecome more standard – for instance, some ‘atypical’ forms of work that are being increasingly used have been subject to regulations, bringing them closer to the standard forms. Finally, among the ‘non-standard’ forms of work, new types are emerging and developing that vary from the more usual ones. The assumption here is that these ‘new’ forms are more ‘non-standard’ than the others. A key objective of this report is to refine the abovementioned dichotomy in the context of the labour market developments currently underway. Among ‘the forms of work’ evident in today’s labour market, the following categories can be listed. Permanent, full-time contractual arrangements, or so-called ‘standard’ contracts – this type of employment is viewed as being ‘more secure’. The main reason for this is that it allows visibility regarding the future evolution of work, income and employability. This employment category has been the basis for determining workers’ rights in social protection regimes and at the workplace. Therefore, these contractual arrangements are defined as ‘standard’ forms of work. Such arrangements still cover more than 50% of the workforce – it should be noted that, since the outset, this form of employment has not covered the entire workforce as other forms of work have always existed. Non-standard forms of work – this category of employment is particularly difficult to pinpoint due to many reasons, but mainly owing to the versatility of denominations used. Originally, any form of work that deviated from the norm of open-ended and full-time employment – such as fixed-term work, temporary agency work or part-time work – was considered to be non-standard work. Various wordings are used when referring to contractual arrangements that go beyond the open-ended, full-time employment contract – most frequently, ‘non-standard work’ (see, for instance, Edwards, 2006; European Commission, 2006) and atypical work (see, for example, Vendramin, 2001; Nienhueser, 2005; Bardasi and Francesconi, 2003; Bredgaard, Larsen and Madsen, 2009). These terms refer to two aspects of employment arrangements: on the one hand, they characterise the contracts according to the employment duration (fixed-term contracts) or the setting (temporary agency work); on the other hand, they refer to specific forms of work (part-time work). As previously mentioned, this overview aims to focus on specific forms of non-standard work. This category can be further broken down into two sub-categories: firstly, the most usual forms of non-standard work (atypical forms of work); and secondly, the ones differing the most from standard forms of work (‘very atypical’ forms of work). This category encompasses fixed-term, part-time and temporary agency work contractual arrangements. The first two types – fixed-term and part-time work – are adaptations of the ‘standard’ forms of work, defined according to the contractual duration (fixed-term) or the number of working hours (part-time). The third type – temporary agency work – specifically departs from the ‘standard’ work form due to the construction of the contractual arrangement: that is, involving three parties and a triangular contractual relationship between the temporary agency (the employer), the company where the work is performed (workplace) and the worker. These forms of work have been defined as ‘non-standard’ as they were devised as an adaptation of the original ‘standard’ work form. Departing from the standard regulations, these contractual arrangements did not initially give workers the same level of rights and protection as those of workers on ‘standard’ employment contracts. However, over time, workers have increasingly begun to obtain similar rights and protection through various pieces of national legislation, European framework agreements signed by the European social partners and subsequent European directives – see, for example, Council Directive 97/81/EC of December 1997 (concerning the Framework agreement on part-time work) and Council Directive 99/70/EC of June 1999 (concerning the Framework agreement on fixed-term work). In quantitative terms, these forms of work have become increasingly common in the labour market. Until recently, the creation of jobs and economic growth were realised through the increase in temporary agency work and other ‘non-standard’ forms of work. In this overview, fixed-term, part-time and temporary agency work will be grouped together under the category of ‘atypical work’. This study examines the abovementioned specific employment arrangements for a number of reasons. Firstly, it appears that these particular forms of ‘flexible’ contractual arrangements are developing. Secondly, the impacts of these forms of work are differently appreciated. Some economic theories suggest a positive impact of ‘non-standard employment’ in general. The hypothesis is that working under non-standard employment contracts is better than not working at all. According to these economic theories, non-standard workers may still acquire specific human and company-specific social capital – such as social connections or ties, information on the job, and access to other vacancies. Therefore, these arrangements are analysed as potential first steps to entering a stable and secure job in the primary labour market. At the same time, employer organisations highlight the need for flexibility in contractual arrangements with a view to adapting to an increasingly globalised economy. On the other hand, trade unions have always been more reserved regarding the use of ‘flexible’ forms of work, that is, non-standard employment: the unions emphasise the impact of less secure contractual arrangements, reduced income and employability developments on workers’ professional and personal lives. The hypothesis explored in this study is that ‘very atypical’ forms of work are not only particularly flexible but also, by their nature, extremely precarious. First of all, most of the very atypical workers live on a low, or even very low, income, as outcome of the amount of hours worked and the short job tenure. Secondly, these forms of work give no clarity regarding the future – especially in terms of job and employability. As outlined, the employability aspects have been discussed among economists, but positive developments still need to be soundly proven – for non-standard forms of work in general, not to mention ‘very atypical’ forms of work in particular. Moreover, beyond the employment contractual arrangement, a short job tenure and low income (corresponding to a few hours work) have an impact on unemployment subsidies, pensions and workers’ rights. In addition, precarious work can jeopardise people’s capacity to pay rent, ability to obtain bank credit, and opportunities to build a family. At societal level, the impact of precarious employment on social cohesion and birth rates should not be underestimated. Figure 1 below shows the entire spectrum of work forms – from the indefinite, full-time employment contracts, which are deemed as being ‘the most secure’ (assimilated to permanent jobs), to the ‘very atypical’ work forms which are the subject of this report and finally the informal arrangements. The two last forms of work are considered as being the most flexible ones. The nature of self-employment varies: this form of work can be found all along the flexibility and security axis. On the Flexicurity axis, one or more employment contractual characteristics (i.e. working hours, contractual duration, contractual setting) move, ‘flexibilising’ the pattern of the ‘standard’ contractual arrangements. Security is understood as combining on the one hand the capacity for a worker to live out of his/her work income; on the other hand it has to do with the visibility for the future, in terms of job guaranty , employability developments, income and other related benefits. While considering the development of these forms of work, two main issues should be kept in mind. Even if there is an increase in the use of atypical and very atypical forms of employment, this aspect of employment contract arrangements still only constitutes a minor element in European labour markets. However, due to a lack of data, precise quantitative estimates and trends assessments are difficult to obtain. This is partly due to the difficulties relating to definitions, as data in many countries combine all non-standard forms of work into a single group or are elaborated according to different definitions. Clearly defined and precise data are thus difficult to find. When assessing these forms of employment, it is important to know what types of employment are the data available for so that proper comparisons can be made. Given the variety of labour market contexts, and the different degrees of usage of non-standard employment forms, it should be noted that work which may be considered as non-standard in one country could be viewed as the norm in another country. Furthermore, data collection are mainly done through surveys (such as the Labour Force Survey, the European Working Conditions Survey, national surveys) that could not be exhaustive regarding the population of workers in these forms of work. Actually, most of these data collections are pure descriptions of the situation at one point in time, not allowing for presenting the successive usages of various status by one worker in one year. Very few countries undertake longitudinal research, the only methodology that could attempt to present a better picture of the real use of these contractual arrangements. As a result of these difficulties, it is important to emphasise the limitations of this study – data from many countries are lacking and comparisons are difficult to make due to differences in definitions across countries. Despite the aforementioned limitations, this report firstly aims to shed some light on the extent and nature of the selected forms of non-standard work, including on whether there has been an increase or decrease in their occurrence over time. Secondly, the report seeks to assess the working conditions of ‘very atypical’ forms of work, attempting to differentiate between those of the ‘atypical’ work forms. In this context, the study will also try to determine if ‘very atypical’ forms of work are a stepping stone to more standard forms of employment, or if they entail a risk of social exclusion. The third objective of this report is to examine the views and actions of the social partners in relation to the selected forms of non-standard work. any other forms of employment that are considered as being ‘very atypical’ in a certain country. These selected forms of non-standard work are assessed in this report, and contrasted where possible against more common non-standard forms of work. Temporary agency work is not considered in great detail here, as it is already the subject of a specific Eurofound comparative study on Temporary agency work in the European Union (Eurofound, 2004). Similarly, two other works which are the subject of Eurofound research, undeclared work and bogus self-employment, are not a particular focus of this report. They are only mentioned for the sake of comparison, although sometimes it may be difficult to make a clear distinction between these forms of work. This comparative analytical report is based on 28 national contributions provided by the correspondents of the European Working Conditions Observatory (EWCO) in the 27 EU Member States (EU27) and Norway. Due to the heterogeneity of the situations covered by non-standard work, exact statistical information on all forms of work covered in this report is not available. Therefore, it is important to once again emphasise the exploratory nature of this study. countries where full-time, open-ended employment accounts for the vast majority of work – such as Bulgaria, the Czech Republic, Estonia and Latvia. The diversity of practice relating to non-standard forms of work is reflected throughout this report. Unfortunately, it is difficult to determine the exact incidence of ‘very atypical work’, as little information exists on the prevalence of these types of jobs. One point that should be noted about the types of non-standard work outlined below is that while, in some countries, such work is performed by individuals as their main employment, in other countries it is carried out by individuals as a way of supplementing their benefits or other forms of income. This is the case, for example, in Austria, where about 50% of so-called ‘marginal workers’ are estimated to be unemployed people, retirees or students. Moreover, studies in Austria have found that nearly half of all marginally employed people have more than one employer and that 4.3% have as many as three employers at the same time. The following sections give an overview of the main issues regarding selected forms of non-standard employment – that is, in terms of definitions and trends. More detailed data, listed by individual country, are presented in Annex 1, Table A1. As mentioned, ‘very atypical forms of work’ are characterised either by specific modifications of the employment contract – as is the case regarding very short fixed-term and oral contracts – or by specific working time arrangements – as seen with regard to very short part-time working and ‘zero hours’ contracts. This overview refers to fixed-term contracts of less than six months. A contextual element of possible interest in the discussion on ‘very short fixed-term contracts’ is the distribution of countries according to the incidence of temporary working in general. In some countries the latter is a widespread phenomenon. For example, in Spain, about one third of the workforce is estimated to be working on fixed-term and temporary employment contracts. By contrast, fixed-term contracts are relatively rare in other countries – such as Estonia, where only an estimated 3% of employment is on a fixed-term basis. Similarly, in Bulgaria, over 95% of employment is estimated to be on an open-ended contract basis. Fixed-term contracts are also relatively rare in Latvia and Lithuania, where open-ended employment accounts for the majority of employment in these countries. Nevertheless, links between the spread of fixed-term contracts in general in a country and the number of ‘very short’ fixed-term contracts are not that straightforward. These links are not easy to highlight, mostly due to the lack of specific data. Specific and contrasting situations exist. In Spain, a country where fixed-term contracts in general are frequently used, more than 9.1 million fixed-term contracts are less than six months in duration, while 2.4. million are between one and three months’ long. In Hungary, only 5.9% of all employees work on fixed-term contracts – of these, however, a significant proportion are very short fixed-term contracts, with 62.2% being less than six months in duration and 42.3% lasting fewer than three months. In Luxembourg, 94% of employment contracts are open ended; therefore, temporary work is quantitatively limited. Nevertheless, of Luxembourg’s fixed-term contracts, a third are less than six months in duration and 17% are less than three months. On the other hand, in the Netherlands, while fixed-term contracts are widespread, only 2.3% of them are of less than six months in duration. In France, almost half (49.4%) of fixed-term contracts are less than six months’ long, while a third (30.3%) last less than three months. ‘Employment on probation’ is a form of fixed-term work that is common in some countries, such as Sweden, where this employment is usually used in the private sector as a test period before the worker is employed on an open-ended basis. Although the incidence of this type of employment has decreased since 2001, figures from 2005 show that about 57,000 employees still work on these types of contracts in Sweden. The maximum duration of ‘employment on probation’ is six months by law in Sweden. It should be noted that in other countries, such as Belgium or France, probationary periods of employment are built into the main employment contract. Regarding the sectors in which very short fixed-term contracts could be found, the first observation is the congruence with the sectors in which non-standard working forms in general –and fixed-term contracts in particular – could be found. For example, in Austria, fixed-term contracts (long and short) are commonly found in the services sector. In Finland, fixed-term working (of more and less than six months) is generally more prevalent in the public sector – particularly in female-dominated sectors such as education, social care and healthcare. Casual and seasonal work is one area where it is difficult to quantify the proportion of workers engaged in ‘very atypical’ forms of work. Many of these workers are classed as persons on ‘very short’ fixed-term contracts, as statistics mostly do not differentiate between very short fixed-term work and casual/seasonal work. However, the recurrence expected is not the same for the two forms of work: the great majority of very short fixed-term contracts are on a once-off basis, while casual and seasonal working by nature is expected to be repeated. Moreover, whether or not casual and seasonal working is specifically defined and regulated depends on the respective countries’ national legislation. Casual and seasonal work is still prevalent in many countries, in specific sectors. This is especially the case in countries with a relatively large and important agriculture sector, such as Italy, Poland, Spain and some of the other new EU Member States (NMS) or in countries with employment related to docklands work. In Denmark, there are still examples of day labourers being hired on a casual daily basis in places such as the Port of Esbjerg in southwest Denmark, although this is now a residual practice. In France, casual workers are employed in sectors such as agriculture and tourism and in the entertainment and audiovisual industries. Many of these workers are classed in this study as workers on very short fixed-term contracts. In Italy, seasonal work is also common in the agriculture sector and, in 2008, the Ministry of Labour and Social Policy (Ministero del Lavoro e delle Politiche Sociali, LPS) enacted for the first time a scheme to regularise the employment of seasonal workers engaged during the grape harvest. Other sectors of the economy where seasonal work, and thus short fixed-term work, can be found to a high degree include textiles and construction. Education could also be concerned too. In Greece, teachers in private evening schools are commonly employed for the period from September to the following May, while others are employed on an hourly basis. Companies using the very short fixed term contracts are of all sizes. In Finland, fixed-term contracts are more common in micro-companies with two to nine employees and in small companies with 10 to 49 employees. This trend is also common in Greece. However, the opposite is the case in Spain, where temporary work is more common in larger enterprises. In Hungary, it appears that smaller companies tend to avoid the use of fixed-term contracts due to the higher costs related to termination before the contract’s expiry. Looking at overall trends, given the lack of systematic and comprehensive data, it is difficult to draw a realistic picture for Europe. Nevertheless, some trend elements should be closely monitored. For example, a significant increase has been recorded in the number of very short fixed-term contracts of less than one month in Greece, constituting a rise of more than 100% between 2002 and 2007, although the total number of employees on these contracts still only amounted to 14,304 workers (see Annex 1, Table A1 for country-specific information on the incidence of very atypical work). In some countries, there is evidence of employees being hired on ‘oral’ contracts – that is, employment without formal written contracts. Nevertheless, there is little comparative data available on the incidence of employment without a formal written contract, due to the fact that many countries require all employment contracts to be in writing, or at least for the employee to have a document containing the written details of their employment. Moreover, these employment arrangements are on the border between formal and informal forms of work, which makes them even more difficult to estimate, quantify and regulate. In general, many oral employment contracts are to be found in the informal economy, which is difficult to document. For example, in Greece, this phenomenon was reported to be widespread, although no official data were available. In Romania, work without an employment contract was estimated to be the norm for 33.7% of the workforce in 2007, although this had decreased slightly from the 37.5% recorded in 2003. Work without an employment contract is much more prevalent in rural than in urban areas in Romania, with the majority of these types of workers employed in agriculture. In Italy, it is thought that a significant amount of work is carried out without a formal written contract in the services, industry and agriculture sectors, although the incidence of this kind of irregular work is estimated to be declining among employees. Even when oral contracts of employment are allowed, these work arrangements remain marginal. In Estonia, oral contracts may be concluded, but only for work that is no longer than two weeks’ duration. Overall, 0.5% of Estonia’s workforce work under these oral contracts and 1.2% are thought to work under undeclared oral contracts. Elsewhere, in Poland, a preliminary contract may be concluded verbally rather than in written form. Changes to the status of seasonal contracts are being discussed in Portugal, where the government proposed in July 2008 a range of changes to the country’s Labour Code – including a clause whereby short fixed-term contracts in seasonal agricultural activities or tourism events, of no more than one week’s duration, would not need to exist in written form. However, the employer would need to communicate the conclusion of the contract to the social security authorities by electronic means. These examples show that while offering an opportunity, oral contracts are in principle strictly limited. Such contracts are considered easier to conclude, entailing less of an administrative burden. However, their usage is relatively constrained – typically to contracts of an extremely short duration of no more than two weeks or one week, and in cases of part-time or seasonal work, or to preliminary contracts only. This section mainly examines part-time contracts of less than 10 hours a week. The incidence of very short part-time working varies across countries, although it usually comprises a small proportion of the workforce. In some countries, there is no specific definition of this form of work. Among the countries that do define it, data are collected in relation to a range of thresholds, although most centre around the 10 hours a week limit – namely, the Czech Republic, Estonia, Finland, Greece, Italy, Luxembourg, Malta, the Netherlands, Norway, Romania, Spain and the UK. Three countries are slightly below or above this average – that is, Bulgaria (less than nine hours a week), Austria (less than 11 hours) and Belgium (less than 12 hours). A further four countries – France, Germany, Hungary and Portugal – consider that part-time work is ‘very short’ when it is under 15 hours a week. In Germany, the most prominent form of non-standard employment arrangements are the so-called ‘mini-jobs’ (geringfügige Beschäftigung), which fall mostly into the category of marginal part-time employment. Although there is no legal limit on how many hours a month people may be employed to receive the maximum salary for this type of job – which has been up to €400 a month since 2003 – most of these jobs can be considered as marginal part-time work, totalling up to 15 hours a week. two frontrunners – the UK and Norway – where a surprising 8% and 10.4% of the workforce respectively work very short part-time hours. Similarly to the very atypical contractual arrangements, very short part-time contracts are clearly localised in specific sectors, depending on the national economy’s characteristics. They tend particularly to be found in the food industry and, as in Belgium, in the personal care and cleaning industries. In Luxembourg, this form of work is common in the domestic services sector, where workers provide services to individuals in their homes. In the Czech Republic, short part-time working is prevalent in the real estate sector, as well as the education, health and social work sectors. The German ‘mini-jobs’ are present in all sectors of the economy, although there is a higher prevalence in the retail and industrial cleaning industries. In terms of a gender divide, as might be expected, workers who work very short part-time hours tend to be predominantly female in many countries. For example, in Luxembourg, 99.3% of workers working fewer than 10 hours a week are women, as are two thirds of workers in this group in the Czech Republic. Overall, emerging trends seem to indicate that very short part-time working is increasing in some countries. In Germany, for instance, there has been a significant increase in mini-jobs as a result of the government policy: in December 2003, some 5,981,807 people in Germany had a mini-job as their only form of employment; this figure rose to 7,103,628 persons in December 2007 (data from the Federal Employment Agency (Bundesagentur für Arbeit, BA), 2008). An additional 2,160,442 employees had a mini-job on top of their main employment in December 2007. Another country witnessing a significant rise in short part-time working is Greece, where the incidence of those working fewer than 10 hours a week rose by almost 96% between 2002 and 2007. Similarly, in Austria, the number of people working fewer than 11 hours a week is estimated to have risen by 77.5% between 2002 and 2006. In other countries, however, it is estimated that the number of people working very few hours on part-time contracts has remained stable or declined. In Belgium, for example, the proportion of employees working very few hours has decreased, because general employment has increased during the last five-year period. This section examines the rather difficult issue of employment forms that do not specify the number of working hours, but which request workers to be available in case the company needs them – that is, on-call working or ‘zero hours’ work. In this respect, the study aims to go beyond the case of doctors or other professions that per contract stipulations have some constraints– such as being available during specific periods of time in which they usually do not work, including nights, weekends or holiday periods. In this context, on-call working is seen as a specific way to perform usual tasks – what is particularly important to note is that such working is foreseen in the original contract and is therefore assumed to be taken into account in the worker’s remuneration. The working arrangements of interest here are of a different nature; these are the on call and zero hours working arrangements that are organised to respond to particular workload and work organisation demands, and do not offer the workers any possibility to plan ahead – either in terms of the number of working hours or the total income to be expected at the end of the week or month. On-call working is a form of non-standard working that is sometimes regulated by law – even though, in many countries, it is not a legal form of working. In other countries, such as Sweden, on-call working is widely practised, despite the fact that there is no specific legislation covering it. In the UK, although there is widespread use of on-call working, no legal definition of ‘zero hours contracts’ exists, and employers are not under any legal obligation to offer any set hours to employees on these types of contracts. Data on zero hours or on-call working tend to vary significantly between the countries. In 10 countries, no data were available on this issue. In four countries – Belgium, Bulgaria, Lithuania and Luxembourg – zero hours working is not recognised by law and thus no data were available. For the countries where data was found, the incidence could be captured. The highest prevalence of zero hours working was found in the UK and Austria (about 5% of the workforce), followed by Estonia and the Czech Republic (around 2.6%), and finally the Malta and Norway (approximately 1%). Some absolute figures were given for Denmark, the Netherlands and Sweden. In the latter country, one fifth of all temporary contracts are considered to consist of part-time or on-call work. Two countries deserve a specific mention – Finland and Italy. In Finland, while there is no official information in this respect, two surveys commissioned by the country’s trade unions highlight that 4% to 8% of respondents are involved in on-call work. In Italy, where zero hours/on-call contracts have been formalised and allowed through 2003 legislation (IT0307204F), 0.7% of all employment is considered to be under this form of contract. As for the previously mentioned countries, this particular form of ‘very atypical work’ is more common in certain sectors.. For instance, zero hours contracts are prevalent in the retail industry in countries such as Austria and the UK. In the UK, workers on zero hours contracts are used to cope with peaks and troughs in demand and to cover long opening hours. In Ireland, zero hours contracts predominate in the retail as well as in the home help sector. In relation to the latter, workers have recently campaigned for ‘more secure terms and conditions of employment’. In Sweden, on-call working is prevalent in hotels and restaurants, along with services involving the care of elderly persons and disabled people. In some countries, this type of working has increased significantly in recent years. For example, in Sweden, the number of employees working on an on-call basis has more than tripled between 1990 and 2005. Specific types of non-standard working are worth mentioning here, as they underline the complex nature of the various non-standard contractual arrangements. Firstly, homeworking deserves a specific mention, as this category of work is prevalent in many of the countries under consideration. Homeworkers are usually self-employed and paid according to the volume of work they undertake. Some specific features of this type of work, depending on the particular country, are uncertainty of income (pay, social security benefits and pensions) and the absence of employment rights enjoyed by regular employees. A large proportion of homeworking is in fact bogus self-employment. It is difficult to pinpoint any particular trends regarding homeworking – although in Romania there appears to be a downward trend, with the recorded number of homeworkers falling from 289,000 persons in 2003 to 58,000 workers in 2007. Moreover, some state schemes subsidising employment contracts should be mentioned as they created a specific relationship, with the public authority granting subsidies either to the employer directly or through reduced social contributions. Some state schemes target private sector employers – as seen in the German ‘mini-jobs’ scheme. Other schemes focus on job creation through public institutions – as is the case regarding the French assisted contracts (contrats aidés) scheme. The objective of state subsidies can also go beyond the creation of work – as seen in relation to the Belgian ‘service vouchers’ scheme, which was primarily established to legalise undeclared domestic and care work (see box below). Similarly, the Danish ‘flexi-jobs’ scheme was aimed at ‘reducing the inflow to the disability pension scheme’ (Bredgaard et al, 2009). In Belgium, the service voucher scheme (titre-service/dienstencheques) has been devised to legalise undeclared work and to create new jobs for low-skilled people, by allowing individuals to pay for domestic help services. The workers work a certain number of hours a week for individuals, providing domestic help; their wages are subsidised by the federal government. Under the scheme, individuals (users) can buy service vouchers for certain types of domestic work from registered companies. The user pays a set amount per voucher (€6.70 for one hour of work), which is tax deductible. The voucher is valid for up to eight months. The registered company, in turn, receives €20 for each voucher for an hour of work from the federal government. Registered companies have nine months in which to redeem vouchers. The services and activities for which the vouchers are applicable encompass activities performed at the user’s home, including cleaning, window cleaning, laundry and ironing, meal preparation and occasional sewing. Works or services are restricted to domestic purposes only. During the first six months of employment, the worker can be employed under consecutive temporary contracts. Belgium’s service voucher scheme was evaluated in 2006, in order to help it generate new jobs, but also to try to combat undeclared work, which is relatively widespread in domestic services work. The evaluation showed that the system is relatively stable and that employers and users reported overall satisfaction with the scheme, although workers expressed some reservations about their pay levels and training opportunities. In terms of combating undeclared work, the evaluation study notes that some 10% of users stated that they had used undeclared work before switching to the service voucher system. It is estimated that about 26,000 people were employed by this scheme in 2006. Depending on countries’ regulatory institutions and processes, legislation and/or collective agreements have been adopted to regulate various non-standard forms of work. In fact, in some countries, both instruments – collective agreements and legislation –are combined, while in others, collective bargaining at tripartite level mainly regulates complex issues concerning non-standard employment arrangements. Denmark is an example of a country combining both tools in this field, while in general collective agreements are more frequently used than legislation to govern the labour market. The Danish law concerning ‘part-time contracts’ (Deltidsloven) secures the same rights as full-time workers for part-time workers in a comparable position in the enterprise; however, if there is no comparable position, the collective agreements are used to settle conditions. In the Netherlands, legislation governing flexibility and security, which came into force in January 1999, allows the sectoral social partners to negotiate on the content of many aspects of the law in order to tailor its provisions to the sector they represent. In Cyprus, a tripartite agreement has been concluded in the tourism sector, covering staff such as waiters and cooks usually hired through fixed-term contracts. This agreement aims to devise a system to protect employees against dismissal during periods when hotels are only partially full. In this case, under a tripartite agreement, hotels may suspend operations during the winter months, usually from November to March, and the employees are registered as unemployed, receiving unemployment benefits without losing their jobs the following season. Alternatively, employers may partially suspend operations and employees can work in turn for six weeks at a time. At EU level, the European social partners formulated successive framework agreements to bring the regulation of non-standard forms of work closer to that of standard forms. EU legislation governing part-time work and fixed-term workers has provided a range of rights to workers under these types of contracts – that is, through the regulations passed under Council Directive 97/81/EC of 15 December 1997 on part-time work and under Council Directive 99/70/EC of 28 June 1999 on fixed-term work. Both of these directives reproduce framework agreements concluded by the European social partners: the European Trade Union Confederation (ETUC), BusinessEurope and the European Centre of Enterprises with Public Participation and of Enterprises of General Economic Interest (CEEP). The directives have since been transposed into national legislation in all EU Member States. Therefore, many Member States have changed their legislation relating to part-time and fixed-term workers in recent years in order to comply with these EU directives. The purpose of the regulation is to guarantee the rights of the workers engaged in these flexible forms of work. Regulation does not solely target non-standard forms of employment in general but can be more specific, devising rules applicable to ‘very atypical forms of work’. With the protection of workers in mind, the EU regulation specifies that ‘short fixed-term contracts have to be related to a particular task or job, and end once the specific project is completed to avoid endless successive short fixed-term contracts. Under EU legislation, if companies employ workers on successive fixed-term contracts, these workers are entitled to the protection workers on open-ended contracts get. The main objective of the EU directives addressing non-standard forms of work is the implementation of the non-discrimination principle and of equal treatment between workers. In the field of temporary agency work, the European social partners in the sector – the European Confederation of Private Employment Agencies (Eurociett) and UNI Europa – agreed on the principle of ‘equal treatment from day one’ in a joint declaration (EU0806029I); this, in turn, boosted the approval of a temporary agency work directive by the European Parliament in October 2008 (EU0811029I). The EU Directive affirms the recognition of temporary agency work as ‘a legitimate and professional economic activity’, pleading for lifting of any existing bans. The role of the social partners in devising rules for temporary agency workers through the negotiation of collective agreements is crucial. Social partners are responsible for the implementation of the ‘equal treatment’ principle. Currently, Italy seems to be the only Member State that has adopted legislation covering a whole range of non-standard forms of work in an explicit way – including even ‘very atypical’ work forms (see box below). In 2003, new legislation reforming the Italian labour market came into effect (IT0307204F). The law introduces numerous innovations in terms of employment services and contracts – such as staff leasing, on-call work, project work and work/training contracts. It also introduced changes regarding the involvement of the social partners in management of the labour market. The main aim of the law was to make the Italian labour market more flexible in order to encourage job creation. The main new types of employment contract introduced by the law are described below. The first type of employment is staff leasing contracts (contratto di somministrazione di lavoro). Under this system, companies may ‘lease’ the workers they need for technical, productive or organisational reasons from employment agencies. Permanent staff leasing is allowed only for particular kinds of work, such as portering and cleaning, surveillance and security, information technology (IT) consultancy and assistance, personal assistance and care services, the management of call centres and other areas to be specified by collective bargaining. As regards the leasing of workers on a fixed-term basis, this may also concern the ‘user’ company’s core activities, and collective bargaining may impose restrictions on its use by employers. The workers on staff leasing contracts enjoy the same rights as employees of the user company, including trade union rights, and they receive the same pay. The leasing companies must pay a sum equivalent to 4% of the remuneration received by the workers on staff leasing contracts into a joint worker/employer fund, to be set up by the parties to a forthcoming national collective agreement for staff leasing companies. These financial resources are used to fund training and retraining courses, along with social security provisions or income support at the conclusion of the workers’ period of employment, and work-entry schemes for disadvantaged workers. The staff leasing system, where the user company has full managerial authority over the workers concerned, differs sharply from subcontracting or outsourcing, whereby the subcontractor exercises such authority. Moreover a staff leasing agency must fulfill all of the requirements that temporary work agencies must meet, and it must furnish all of the protection envisaged for temporary agency work, which is replaced by fixed-term lease work. In addition, the law envisages that staff leasing may be used to favour the entry or re-entry into work of disadvantaged groups of workers – initially, through specific projects carried out jointly by staff leasing agencies, job placement services and local authorities. A second type of employment contract covered by the new legislation is on-call work (lavoro intermittente), whereby the worker is available to be engaged by the employer for a pre-established period of time. However, the employer may make use of the worker for only a limited number of days during this period, depending on production peaks and organisational needs. The employer must notify the worker that their services are needed at least one working day in advance. Furthermore, the on-call work contract must stipulate the monthly allowance to be paid to the worker during the period of their stand-by availability to the employer. This amount should be fixed by collective agreement, but may not be less than a level established and periodically updated by Italy’s Ministry of Labour and Social Policy, after consultation with the employer organisations and trade unions. The law also covers job sharing (lavoro ripartito), an arrangement based on ‘a special contract whereby two or more workers jointly assume the responsibilities of a single work obligation’. The workers may decide – informing the employer on a weekly basis – on substitutions and exchanges, as well as alter their schedule of working hours. Pay and social security contributions are not calculated beforehand but on a weekly basis. A fourth area concerns part-time work. In order to encourage companies to use part-time work – and to facilitate the labour market entry of people who need to reconcile work with family responsibilities, study or other commitments – the law seeks to foster the use of part-time work. This encompasses both ‘vertical’ (comprising working days similar to those of full-time workers, but with the number of working days reduced) and ‘horizontal’ (with reduced working hours every day) part-time work. The law aims to encourage the use of part-time work by including ‘elastic’ clauses, which allow employers to increase working time and modify schedules, according to criteria and the conditions agreed by the parties. The law also encompasses changes to the rules governing employer-coordinated freelance work (collaborazione coordinata e continuativa), or ‘semi-subordinate’ contracts, which affect about 2.3 million Italian workers (IT0011273F). The amended rules state that employer-coordinated freelance work should concern ‘one or more specific projects or work programmes, or phases thereof, determined by the employer and managed autonomously by the freelance worker, who is responsible for the final result, in coordination with the employer organisation and regardless of the time taken to complete the work’. This provision effectively forbids open-ended contracts for employer-coordinated freelance work. It aims to re-regulate this type of employment relationship, either by linking it to a project or bringing it under the regulations on subordinate work. A fifth area of regulation concerns supplementary work (lavoro accessorio), which is ‘work of a merely occasional nature undertaken by persons at risk of social exclusion or who have not yet entered the labour market or who are about to leave it’. The term ‘merely occasional’ denotes activities involving a worker for no more than 30 days in a calendar year, and for which the remuneration amounts to no more than €5,000 in a calendar year. The service performed must take the form of minor and exceptional domestic work (for instance, childminding or care of elderly persons), private tuition, gardening or the organisation of social, sporting, cultural or charitable events. In order to regularise these employment relationships, the employer must purchase ‘vouchers’ comprising both pay and social security contributions, which it issues to the worker. Each voucher booklet for supplementary work has a nominal value of €7.50 for an hour of work, of which the worker receives €5.80. A final area concerns contracts with a training component, such as apprenticeships. The law makes it possible to conclude an apprenticeship contract with a young person aged 18–29 years for various purposes: fulfilling the right/duty to education and training; gaining a qualification by means of on-the-job training and technical or professional instruction; or acquiring a diploma or complementing a higher education programme. Furthermore, for particular categories of workers – including young people aged 18–29 years and disadvantaged workers such as long-term unemployed people aged under 32 years, unemployed workers aged over 45 years, and women living in areas with high levels of female unemployment – the law introduces a ‘work entry contract’. This contract aims to achieve ‘by means of an individual project to adjust the worker’s professional skills to a particular job, his or her labour market entry or re-entry’. This employment relationship replaces the former work/training contract (contratto di formazione e lavoro), which had been criticised by the EU for its overly wide scope of application. Employment rights have been devised to fit the characteristics of ‘standard’ forms of employment. Therefore, workers on ‘non-standard’ contracts did not originally benefit from the same rights. Progressively, however, the employment rights of workers on non-standard forms of contract have come closer to those of standard workers. EU regulations and their transposition into national norms in each EU Member State allow for the recognition and development of these rights. Furthermore, workers in non-standard employment who feel that their employment rights are being breached usually have access to the same mechanisms for redress as workers in standard forms of employment – that is, employment tribunals and labour courts. In many countries, a dedicated phone helpline has been set up to enable workers to lodge complaints about breaches of employment rights. Nevertheless, there are still areas where non-standard workers do not benefit from the same rights, both individual and collective ones. Dismissal could be one of them. In Ireland and the UK, for instance, the right to claim unfair dismissal is only available to workers with one year’s service or more. Therefore, workers on contracts of less than one year are not covered by this right. This provision has impacted on employment contractual arrangements: in particular, a tendency for short-term contracts to be concluded for a period of less than one year has been observed. Collective bargaining coverage is another area where differences can be seen. Firstly, the process of collective bargaining requires the participation of social partners – non-standard workers are sometimes not represented as such by the existing social partner organisations. When social partner organisations do represent non-standard workers, specific collective agreements can be concluded – as seen, for example, in Italy, where specific collective agreements exist for temporary agency workers, bargained by the relevant social partners. However, the transient nature of many non-standard forms of work makes it difficult to organise the workforce. Nonetheless, some trade unions have established specific branches dealing with certain types of non-standard workers. In Denmark, for instance, a trade union representing freelancers, the Union of Commercial and Clerical Employees in Denmark/Private (HK Privat), gives legal guidance to freelance members regarding terms and conditions of employment. In the UK, the law distinguishes between ‘employees’ and ‘workers’, with the former having access to more complete employment rights. As many workers on atypical employment contracts do not qualify as employees, but rather as workers, they do not have access to many of the rights enjoyed by employees. However, they are still covered by statutory minimum wages, as well as working time and health and safety legislation. Implementation of the labour laws is not an easy task. Although the health and safety laws of most of the countries in this study cover all workers, including those on non-standard and very atypical contracts, it can be particularly difficult to enforce health and safety laws in regard to the latter. In Slovenia, trade unions believe that health and safety provisions are often not applied to seasonal workers as rigorously as they could be. Moreover, the trade unions contend that control mechanisms do not function particularly well. In most countries, the national labour inspectorate has an overall role to ensure the health and safety of all employees. This is particularly important, given the fact that many workers in non-standard forms of employment are not unionised. In some countries, the labour inspectorate places a special emphasis on ensuring the health and safety of workers on non-standard contracts, particularly as it is known that these workers are especially vulnerable to health and safety risks. In Norway, the Norwegian Labour Inspection Authority (Arbeidstilsynet) may give advice and direction on the interpretation of laws regulating non-standard employment. Nonetheless it is important to underline, as many EWCO reports stress, that Labour Inspectorates services in the EU Member States encounter major difficulties to perform their tasks, because of the lack of both resources and personnel. In some countries, targeted campaigns have been launched, aiming to raise awareness on health and safety issues for workers on non-standard contracts, along with vulnerable workers. In Portugal, these workers have been identified as vulnerable by the country’s ‘National Strategy for Safety and Health and Work 2008–2012’, and it is believed that awareness-raising campaigns should be launched with the aim of developing and consolidating a ‘prevention culture’. In Sweden, the Swedish Work Environment Authority (Arbetsmiljöverket, AV) has the power to inspect workplaces that it believes are especially exposed to risk. AV also launches projects and campaigns that target specific problems or sectors of the economy. However, no exact data on atypical work are collected. Similarly, in Ireland, the Health and Safety Authority (HSA) carries out inspections in sectors deemed to be at high risk in terms of health and safety compliance – essentially, the mining and quarrying sector, agriculture and construction. Although no precise details on non-standard employment are available, this type of employment is believed to be relatively common in these sectors. In Bulgaria, targeted sectoral health and safety inspections are also carried out by the general labour inspectorate. In the Czech Republic, the State Labour Inspection Office (Státní úřad inspekce práce, SÚIP) carries out inspections in accordance with a yearly plan that identifies problematic sectors, in addition to conducting spot checks on the basis of a complaint or other impetus. In Cyprus, due to relatively low numbers of labour inspectors, it is difficult to inspect all workplaces. Therefore, workplaces are usually classed by their degree of risk and thus the inspectors visit work premises in order of priority. Overall, it should be emphasised that workers engaged in ‘non-standard’ forms of work tend to be extremely heterogeneous. Therefore, it is difficult to generalise about their quality of work. Furthermore, as previously seen, it is difficult given the lack of data to distinguish workers performing ‘very atypical forms of work’ from the whole range of workers engaged in non-standard work. balance between working and non-working life. This same framework has been used to attempt an analysis on workers engaged in ‘very atypical’ forms of work. Nevertheless, the analysis encounters some limitations, due to the lack of specific data regarding particular forms of employment contractual arrangements. Career development and employment security are connected. Career development offers opportunities for the enhancement of income and skills, and therefore consolidates workers’ employability and confidence in their capacities. These are key elements of employment security, reassuring the workers about their capacities for finding employment. Such features differ depending on workers’ employment contractual arrangements. Workers in ‘non-standard’ forms of employment are generally less likely to have fixed career plans, compared with those engaged in more standard forms of employment. In Italy, according to a survey carried out in 2006, workers on non-standard contracts are less satisfied with their career opportunities than other types of workers (Institute for the Development of Vocational Training (Istituto per la Formazione Professionale dei Lavoratori, Isfol), 2007). In Romania, respondents reported that career opportunities and general prospects for workers engaged in non-standard forms of work are dictated by individuals’ own means and determination to succeed, rather than by any type of specified career framework. Therefore, employment security can also be an issue. Employment security has to be considered from both objective and subjective perspectives. On the objective side, elements for consideration include the contract duration and employment tenure; on the subjective side, issues such as feelings of security and help assessing employment security are significant. In Portugal, data from the International Social Survey Programme (ISSP) Work Orientations III 2005 revealed that individuals employed on a full-time basis seemed to feel more secure than part-time workers. A higher percentage of respondents working full time believed that they had a secure job when compared with those working only 34 hours a week or less. Surprisingly, workers working fewer than 15 hours a week agreed (or strongly agreed) that their job was secure in a higher proportion than among those working between 15 and 34 hours a week. This figure may be partly explained by the fact that, among those working less than 15 hours a week, some may have deliberately chosen to work this amount of hours. On the other hand, of those working less than 15 hours a week, the proportion of respondents strongly disagreeing with the job security assertion was also significantly higher, covering almost one quarter of all respondents. In the Netherlands, in the case of part-time workers working fewer hours, job insecurity in terms of the probability of losing one’s job is reportedly high; however, the seriousness of job loss is often low. These findings may be attributed to various reasons – such as the fact that other jobs may be easy to find or that workers may have another (second) job. On a different level, these results are sometimes explained through access to other sources of revenue, such as one provided by a partner or parents, although, in these cases, the financial autonomy work should give the workers is lacking. The social context in which these practices are embedded is critical. Part-time work is a widespread phenomenon in the Netherlands; therefore, it is a socially accepted form of employment and the insecurity risk linked to it is also more socially accepted. In terms of income, non-standard forms of employment are usually linked with low incomes as a result of their characteristics – either due to the specific contractual duration or the limited working hours. Therefore workers in these forms of work receive a lower revenue from their work than standard employees. In a few countries, incomes of all employees are dealt with in the same way, as in Sweden, for example, where pay is regulated through collective agreements that cover both employees in standard and non-standard employment. However, this similarity of process does not per se guarantee equality of income. In some countries, however, income is not considered to be low for workers on non-standard contracts. For instance, workers on non-standard employment contracts in Denmark tend to be self-employed freelancers, whose wages are generally higher on an hourly basis than their employed counterparts. Nevertheless, as far as the overall revenue is concerned, workers still get lower incomes due to these specific employment arrangements. These workers do not benefit from either sick pay or holiday pay. Moreover, the social security contributions they pay are higher than those paid by employees, as the amount is not split between workers’ and employers’ contribution. In general, nevertheless, non-standard employment tends to be associated with lower rates of pay than more standard forms of employment, as many workers in this category work in relatively low-skilled jobs. Studies in Belgium have indicated that workers with comparable experience and education or skill levels receive on average 5% lower pay if they work on a temporary contract, compared with workers on open-ended contracts (Sels et al, 2002). The differential increased if comparing with employees higher up in a company’s hierarchy. In the UK, although all workers are legally entitled to be paid the national minimum wage, research on the pay of part-time workers shows that they are not as well paid as comparative full-time workers (Trades Union Congress (TUC), 2008). One issue that makes it difficult to properly assess the pay levels of non-standard workers is the fact that, in some countries, these workers are younger than their counterparts on standard contracts and hence have less work experience. This is the case in Finland, for instance. As a result, it is difficult for commentators to ascertain whether lower pay for non-standard workers is due to the type of contract or to the fact that these workers have less work experience than others. Bonuses are another factor impacting on overall pay levels. In Finland, for example, the Finnish Quality of Work Life Survey 2008 shows that workers on fixed-term contracts – whether long or short – are less likely to be part of results-based bonus systems than those on open-ended contracts. A further consequence of non-standard forms of working is the impact on social security and pension coverage. If workers are working a small number of hours each week or are in precarious employment that is not continuous, this will have a negative impact on their social security coverage and entitlements. In Greece, as teachers in private evening schools are commonly employed for the period from September to May, they consequently have difficulties in accruing pension insurance coverage. In Ireland, it is estimated that fewer than 10% of non-permanent workers are covered by occupational pension schemes – moreover, it is thought that this figure will decrease even further in the case of workers on ‘very atypical’ types of contracts, although no precise data are available. Finally, the transient nature of non-standard contractual arrangements has a negative impact on workers’ overall financial capacities, beyond the employment sphere. For instance, data from Slovenia suggest that freelance journalists find it difficult to obtain bank loans due to their insecure employment status. As mentioned above, persons working in non-standard employment are at risk of low incomes. Given that ‘very atypical’ forms of work exacerbate the characteristics of the non-standard forms, with fewer hours of work and very short duration of contracts, it can therefore be expected that incomes will be even lower and financial capacities even more at risk. In Austria, for example, studies have found that workers on short fixed-term contracts have a higher than average risk of living in a household where incomes are below the ‘at-risk-of-poverty’ threshold. In addition, an Austrian survey on part-time workers and marginally employed people found that 71% of marginally employed individuals cannot live on their income, while 22% can ‘barely’ live on their income (Berndt, 2006). Similarly, surveys in the Netherlands show that over two thirds of workers with an income of under €500 a month work on very short part-time contracts (Klein Hesselink et al, 2008). In the field of health and well-being, the specific characteristics of very atypical employment once again make it particularly difficult to assess the impact of working conditions on this aspect of quality of work. This is mainly due to the very short duration of exposure to the risk. Evidence from a range of working conditions surveys, highlighted by the EWCO national correspondents,indicates that workers on very atypical contracts generally tend to work in more hazardous jobs or conditions than their counterparts on more standard contracts. This, in turn, can increase the incidence of work-related accidents in the case of these workers. Conversely, respondents in the Netherlands reported that exposure to risks and accidents at work is not particularly high for workers on very atypical contracts. Some health and safety issues appear to disproportionately affect some groups of these workers. In the UK, for example, although all workers are covered by health and safety legislation, there is evidence that homeworkers are not aware of these regulations. In addition, in the Netherlands, many workers in very non-standard employment belong to specific groups such as older workers, which are subject to specific health and safety considerations. Little data are available on exposure to risks and accidents at work in the case of workers engaged in very atypical forms of employment. In Finland, data show that employees on fixed-term contracts (long and short) are more exposed to risk of infection from serious disease, although this can be explained by the fact that these workers are more likely to work in the health sector. Furthermore, in Luxembourg, more than one third of the work-related accidents recorded in 2007 involved temporary agency workers. Figures from Spain’s General Workers’ Confederation (Unión General de Trabajadores, UGT), along with reports from the country’s National Institute of Health and Safety in the Workplace (Instituto Nacional de Seguridad e Higiene en el Trabajo, INSHT), show that workers on fixed-term contracts in Spain overall suffer disproportionately from occupational accidents and injuries. These figures are reported to be even higher in the case of short fixed-term contracts. In Italy, studies have found that very atypical workers are more likely to be engaged in jobs that involve physically demanding work. Specific health and safety risks are apparent in the case of migrant workers, particularly if they do not adequately speak the language of the host country. As a representative of the UK’s Union of Shop, Distributive and Allied Workers (USDAW), which represents workers in the retail sector, outlined: ‘While the multi-ethnic composition of the workforce has grown in recent years, multi-language communication within companies has not.’ This has caused problems and raised serious issues, particularly in the area of health and safety. Immigrant labour is also an issue in Malta, where many African migrants work in the construction sector. In particular, these migrants tend to lack knowledge about occupational health and safety procedures. Moreover, communication is difficult due to language barriers. In many countries, health and safety risks and exposures are linked to the sector in which workers on very atypical contracts work, such as the construction and agriculture sectors. In Greece, for example, the construction sector accounts for 55% of fatal work-related accidents. However, only 8% of workers in this sector are formally employed and the workforce is dominated by migrant workers, temporary work and seasonal employment. Subcontracting and self-employment are also prevalent in this sector. This contributes to a lack of health and safety training as well as experience, all of which make the occurrence of accidents more likely. For example, research conducted in Greece has shown that the risk of occupational accidents is 66% higher for migrant workers than for native workers (Robolis and Targoutzidis, 2009 (forthcoming)). In general, the same issues are relevant for the Greek agriculture sector, where temporary and seasonal work dominate: in 2007, there were 1.2 million seasonal workers in the Greek agriculture sector, compared with 24,000 permanent employees. Furthermore, the increased risk exposure is compounded by the reduced social protection coverage for these workers. In some countries, such as Slovenia, workers on very atypical contracts are less likely to be covered by social insurance funds such as disability and health insurance, as the employer is not obliged to pay contributions into these funds for these workers. Similarly, although the individuals carrying out mini-jobs in Germany are covered by statutory accident insurance, there is no obligation for these individuals to be covered by statutory health insurance. As private health insurance is expensive, it could be expected that workers in ‘mini-jobs’ find it particularly difficult to be insured. In relation to work-related health problems, two contradictory aspects have to be considered. On the one hand, the limited exposure duration of workers on very atypical contracts should lead to fewer health problems. On the other hand, specific features of the very atypical contractual arrangements – mainly the very short duration and higher feelings of insecurity – could have a high impact on workers’ health. In some countries, temporary workers report fewer health problems than those on open-ended contracts, due to the fact that they are in the job for only a short time, and therefore their exposure to risks is limited. It may also be the case that these workers are generally younger and therefore not as likely to suffer from as many specific health problems as older workers. Finally, it is well known that health problems build up and could appear many years after the exposure to the risk; therefore, given the transient nature of non-standard work, these problems are more likely to remain dormant during the time of performing the non-standard form of work. These features naturally apply to workers engaged in very atypical forms of work. On the other hand, the specific features of these forms of work make workers in very atypical contractual arrangements more prone to specific work-related illness. There is evidence in some countries that workers engaged in very atypical forms of employment are more likely to suffer a range of negative psychological effects than those working in standard forms of employment. Such effects could include lower levels of job satisfaction, reduced commitment to the organisation, and lower general life satisfaction, which are all linked to issues such as lack of job security, low pay and general lack of well-being. However, it is often difficult to isolate the cause of this negative impact on workers, as those engaged in very atypical work are also often working in low-skilled jobs, where their low levels of job satisfaction might not differ substantially from those of their colleagues in more standard forms of employment. In various Member States, studies have been conducted to analyse how much workers are satisfied with their work. This subjective measure tries to encompass various aspects – especially how much the nature of the contractual employment has an impact on job satisfaction. The results are difficult to interpret, nevertheless. In Spain, when workers were asked whether they found their job interesting, 63.5% of respondents on open-ended contracts said that they found it interesting, compared with 49.3% of those on short fixed-term contracts. However, employees working fewer than 15 hours a week in Portugal appeared to be more satisfied with their job than those working between 15 and 34 hours a week, and were almost as satisfied with their jobs as full-time workers (data from the ISSP, Work Orientation III Module 2005). Research from the UK, carried out by the Department for Business Innovation and Skills (BIS), found that workers in insecure jobs were more likely than other workers to suffer from mental health problems, including depression (Dunstan and Anderson, 2008). Studies in Sweden have shown a link between individuals who are worried about their personal financial situation – such as those in insecure forms of employment – and their level of psychological well-being. These individuals are reported to suffer more frequently from stomach, neck and back problems, and they experience more headaches and tiredness than employees on open-ended work contracts (Aronsson et al, 2005). In Norway, 13% of workers with no written contract and 12% of workers with zero hours contracts or who are on on-call contracts fear losing their jobs, compared with 10% of the general working population. In Finland, research has reported that 42% of employees on fixed-term contracts felt that this form of working was mentally stressful, due to its insecure nature; a further 56% of these workers indicated that planning for the future was difficult. Nevertheless, about half of the employees in this research also stated that, for them, a fixed-term contract was linked to a positive feeling of freedom. In some cases, workers who are recruited to work on specific projects may be subject to more work-related stress than people who are employed on a more long-term and ongoing basis. This can be exacerbated by the blurring of boundaries between work and private life. In Denmark, for example, film and television freelance workers reportedly feel more stressed than other employees, on average. Nevertheless, many skilled workers on non-standard contracts – such as those in the arts, culture and entertainment industries – enjoy a high level of interest in terms of job content, as well as high levels of job satisfaction. In Finland, a greater proportion of workers on fixed-term contracts (46%) than those in permanent employment (39%) regarded their work as ‘very important’. To correctly interpret these data, it would be necessary to know the exact reason why workers are engaged in these types of contractual arrangement. Skills development is one significant aspect of quality of work. The trends observed for non- standard workers in the field of skills development also exist for workers engaged in ‘very atypical’ forms of work. One of the first trends observed is that workers in non-standard forms of work in many countries do not reportedly have access to the same training and career development opportunities as their counterparts in standard forms of work. Research shows that training and skills development opportunities are offered to a much greater extent to workers in the long term, particularly to those who have an indefinite and permanent employment relationship with the employer. Training is not seen as a ‘public good’, except with regard to initial training; therefore, companies only invest in ‘their’ workers, with a request of immediate ‘return on investment’. Moreover, the development of different types of ‘temporary’ contractual arrangements has proven to weaken the relationship between the workers and the company. Employers have no interest in people who will leave rapidly, while workers on temporary and ‘very atypical’ contracts do not feel committed to the company. In Belgium, studies have shown that one third of temporary agency workers received training paid for by their employer over a specific period of time, compared with three quarters of employees on open-ended contracts. The same is true in the Czech Republic, where employers would rather invest in full-time and permanent staff. The 2007 Labour Force Survey in the UK shows that only 8% of temporary agency worker respondents had received any job-related training during the previous four weeks, compared with 16% of all employees. Furthermore, over twice the proportion of temporary agency workers (61%) had never been offered training by their employer compared with the proportion of all employees (30%). However, data in some countries suggest that workers in non-standard forms of work are not significantly disadvantaged in terms of access to training and career development opportunities. For example, in Estonia, the Working Life Barometer Survey indicates that 71% of employees in standard employment and 65% in non-standard employment claim that they have either good or average opportunities to participate in work-related training, while 48% and 46% respectively believe that they have good or average opportunities for career advancement. Similarly, in Norway, 70% of people engaged in non-standard forms of work report that their job provides good opportunities for further skills development. Moreover, as many as 80% of these workers report that they have good opportunities to use their knowledge and skills in their job, which is only slightly lower than the percentage for the general working population (90%). Nevertheless, as there is a strong correlation between non-standard forms of work and low-skilled jobs, workers in non-standard employment generally tend to benefit less from training opportunities. In reality, many workers in non-standard forms of employment perform relatively low-skilled tasks in mostly labour-intensive sectors, such as retail, industrial cleaning, the care sector and agriculture. Skills development is seen to be more difficult for workers in ‘low-skilled’ occupations, even though they are the ones most in need of such opportunities. According to the report findings of the TUC Commission on Vulnerable Employment, ‘the incidence of monotonous tasks and inflexible working schedules has been found to be higher among temporary staff’ (TUC, 2008, p. 13). Reduced variety of tasks and demands are seen as characteristics of low-skilled jobs, such as cleaning and domestic help. These features paradoxically seem to explain the poor levels of opportunity for skills development in these sectors. On the one hand, most of the workers recruited into these occupations are ‘low qualified’, not having a school-leaving certificate and, as mentioned, these workers have less opportunities to be offered training. On the other hand, the tasks performed in these jobs – which are not considered to be challenging – have not been systematically analysed and broken down according to competences and skills; therefore, no career path is usually devised. Some groups of highly-skilled workers also predominantly work in non-standard employment. For example, in the UK, a majority of workers in the higher education sector are employed on fixed-term contracts. In the case of higher-skilled professionals, such as IT professionals and workers in the creative arts, the work is likely to be much more varied and satisfying. In these jobs, there is also more scope for individual skills development and the accumulation of different types of experience. In addition, workers who are the most skilled and in so-called ‘high skilled’ occupations are generally particularly advantaged as regards benefitting the most from training opportunities. In terms of ‘very atypical’ forms of work in particular, a number of specific observations have been made: workers in these contractual arrangements have even poorer opportunities for skills development, while fewer opportunities are offered by companies in this respect. In Portugal, for instance, surveys have found that individuals working fewer than 15 hours a week have fewer opportunities for career advancement than employees working more hours. In Spain, research suggests that the shorter the contract, the less likely it is that a worker will participate in a training course or receive a promotion as a result of this training. Elsewhere, in France, research reveals that the majority of training and development received by workers in very atypical forms of employment takes place during periods of unemployment and is paid for by the government. Moreover, looking at recent labour markets trends, there is an increasing mismatch between workers’ qualifications and skills requested for the job. As various research shows, some qualified workers work in ‘low-skilled’ jobs (see Lyly-Yrjänäinen, 2008). Features of the current labour markets show a reduction in job offers combined with rising numbers of qualified unemployed persons; the most qualified are generally recruited first, even if they have a higher qualification than required. This constitutes a ‘lose-lose’ situation, as it creates frustration for the worker and leads to negative impacts on workers’ efficiency and productivity. Little information has been gathered from the national contributors on the issue of reconciling working and non-working life. However, many workers on non-standard contracts appear to have less control over their working hours, and their shifts are often flexible. According to the results of the European Working Conditions Survey (EWCS), these workers find reconciliation of working and non-working life more difficult. Lack of job security is inevitably intrinsic to short fixed-term contracts and fixed-term contracts as a whole. This feature, combined with low wages, can lead to significant disadvantages for many workers on non-standard contracts – such as difficulties in obtaining financial loans and mortgages. This is reportedly the case in a range of countries, including the Czech Republic. Similarly, in France, research has found that 85% of workers on fixed-term and temporary contracts stated that they were worried about their precarious employment status and that this situation kept them from making decisions on long-term issues, such as housing. Isolation can be another social consequence of working in a non-standard way – workers recruited to work on specific projects may often work in isolation, which can in turn lead to social isolation. The insecure nature of many non-standard forms of working is reported to have had demographic consequences in Sweden. In particular, it has been found that the increase in temporary employment in Sweden since the 1990s has increased labour market insecurity in this country (see Aronsson et al, 2005; Wallette, 2004). As a consequence of the rise in temporary work, it is reported that many couples are hesitatant to have children. There is not a great deal of data showing that individuals working in ‘very atypical’ forms of employment work different sets of hours than employees engaged in more standard working arrangements. Nevertheless it can be assumed that the pattern seen for non-standard forms of work generally applies also to ‘very atypical’ forms. In Hungary, workers on fixed-term contracts are estimated to be more likely to be exposed to unpredictable working hours than those on open-ended contracts (9.3% compared with 5.6%, respectively). In Latvia, however, while the proportion of non-standard workers working at weekends and performing evening and night work is high, it is nevertheless declining. The share of atypical workers working nights, for instance, decreased from 17% in 2003 to 13% in 2007. Weekend work has also declined in Latvia, from 55% to 40% during the same period. In Greece, evening work is usually or sometimes performed by about 60% of workers on part-time contracts of fewer than 10 hours a week and by workers on fixed-term contracts of between four and six months’ duration; the same is true for about 47% of workers on fixed-term contracts lasting between one and three months. However, very few of these workers usually or sometimes work nights. In Spain, it would seem that the shorter a worker’s contract, the higher the possibility of working shifts and overtime. In the case of zero hours and on-call working, individuals are more likely to work during so-called ‘unsocial hours’, such as during the evenings, at weekends or on public holidays. Finally, for some groups of workers, such as those in the entertainment industry, working is solely based on events and is therefore frequent at weekends and in the evenings. Similarly, there is also a dearth of data on the shift patterns of non-standard workers. Nevertheless, in Greece, for example, although shift work is not particularly widespread, it is found to be more common in the case of short fixed-term contracts of between four and six months’ duration than for other workers. Furthermore, in many non-standard forms of working in the agriculture sector, hours of work tend to be irregular and fit in with the ‘dawn to dusk’ nature of farming. Studies from the Netherlands have found that workers on short part-time and zero hours contracts work less overtime than other workers, and are more often involved in working shifts, evenings, nights and weekends. Moreover, according to data from the Organisation for Economic Co-operation and Development (OECD), workers on temporary employment contracts tend to have less control over their working time than those on permanent contracts. The OECD notes that the ‘finding with respect on inflexible work hours is particularly noteworthy since it highlights the possibility that the scheduling flexibility associated with temporary jobs may more frequently be used to satisfy employers’ production needs than workers’ time-use preferences’ (OECD, 2002). In terms of zero hours contracts, shift work generally seems to be more common among individuals working on these types of contracts than for employees on standard contracts. Annex 1 gives an overview, by country, of the nature of non-standard work in terms of sector, type of enterprise, type of activity and work organisation. and transitions from one form of work to another. Non-standard employment is central to the flexicurity debate. Successive European Commission Communications (for example, the 1997 Green Paper on ‘Partnership for a new organisation of work’, the Communication of June 2007, ‘Towards common principles of flexicurity: More and better jobs through flexibility and security’ (83.9Kb PDF) and the EC June 2009 Communication on ‘A shared commitment for employment’) highlight the need of flexicurity for economic growth. Flexible employment contractual arrangements are presented by companies as a way to cope with globalised markets. They are needed to adapt work organisations to both the financial possibilities and production needs. On the other hand, European institutions recognise that an increase in flexibility should be accompanied by the development of workers’ protection. The two so-called ‘initial models’ of flexicurity represent two directions in which to go. In Denmark, ‘flexibilisation’ of standards forms of work was sought through organising the labour market policy responses with a view to securing transitions. Whereas in the Netherlands, an increase in ‘securisation’ of flexible work arrangements was the objective. In Slovenia, discussion has been ongoing with regard to legal changes that aim to make the labour market more flexible. Flexicurity has also been the focal point of debates in Bulgaria and Lithuania, while in Finland, a high-level group on flexicurity was set up in August 2007. In France, discussion is ongoing on non-standard working, with opposing views emerging regarding the nature of the labour market: the employer side argues that it is too tightly regulated and that increased flexibility would reduce unemployment; on the other hand, the trade union side contends that the development of very atypical forms of employment weakens employee protection. In Norway, where recourse to temporary and part-time working is relatively tightly regulated – with a view to preventing misuse – the debate has recently centred on the possibility of widening employer recourse to part-time working in general. The Norwegian government is in favour of this move, supported by the employers; however, the trade unions argue that this would weaken employment protection. In Italy, the labour market has been opened up to new forms of working relatively recently, largely under labour market reforms enacted in 2003. In this country, the debate centres on whether the increased flexibility has made a difference to the employment rate and whether non-standard work is harmful to individual careers. Zero hours contracts have been the focus of recent debate in the UK, with some trade unions campaigning to ban this type of working. However, employer representatives in the UK’s retail sector, where zero hours work is common, have defended the practice as offering flexibility to employees also. In countries where fixed-term working is relatively unregulated, the debate takes on a different character. For example, in the UK, the use of fixed-term contracts among staff in higher education has been the focus of recent discussions, with the trade unions opposing it. In other countries, such as Sweden, the debate has centred on part-time work. In this case, there has been much debate about whether part-time workers should have the legal right to full-time work. Government-sponsored employment contracts are the focal point of debate in other countries. In Germany, for instance, the discussion has centred on mini-jobs, with views emerging that mini-jobs are displacing standard forms of employment in certain economic sectors, such as cleaning, hotels, restaurants and catering, and retail. In the Czech Republic, the debate is also focusing on non-standard forms of work that aim to help vulnerable groups of individuals gain access to the labour market – such as parents on maternity leave and parental leave, people with a reduced capacity to work, those over 50 years of age, or persons caring for dependants. Views on non-standard forms of work depend, to some extent, on the impact that the form of employment contract has on workers’ employability and career path. If individuals can make the transition from non-standard working to more standard forms of work, for instance, then the former can be regarded as an important stepping stone into the regular labour market. However, if evidence exists that non-standard working is essentially a ‘dead end’ or, even worse, a route into inactivity, then this will alter the character of the debate significantly. 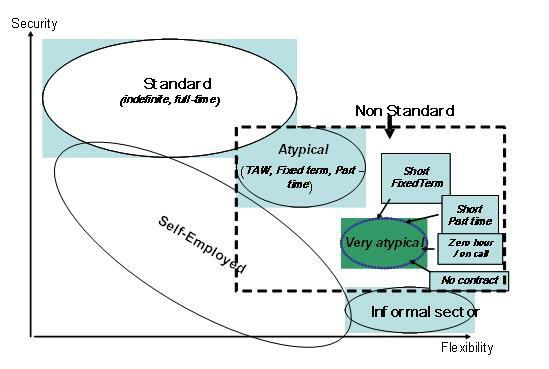 Data on transitions between non-standard and standard forms of employment are difficult to find, although some studies attempt to address the link between the two. In many cases, the number of individuals successfully making the transition would depend on the stage of the economic cycle. In addition, workers in non-standard forms of employment may have entered this type of working, due to factors such as commitments in other areas of their lives – as a result, they would be unlikely to want to move into more standard forms of employment. Governments in some countries, such as Italy and Spain, have been encouraging employers to convert fixed-term contracts into open-ended employment relationships, in order to reduce the overall incidence of fixed-term working and to boost employment stability. In Italy, for example, it is estimated that between 2002 and 2006, almost 571,000 non-standard – usually fixed-term – contracts were converted to open-ended contracts. Overall, however, and besides government intervention, the evidence seems to be inconclusive as to whether non-standard work is a route into more standard forms of employment or a way into inactivity. In Austria, for instance, one study shows that job starters often begin their careers in marginal employment, thus moving on to other forms of employment at a later stage (Kaupa et al, 2005). Nevertheless, the study also reveals that one third of workers in marginal employment had previously worked on a full-time employment contract. One study in Belgium found some evidence that temporary work could act as a stepping stone to employment for unemployed school leavers, although it could delay the transition to open-ended employment in the case of all school leavers (Verhofstadt, 2007). In Italy, however, data from the National Statistics Institute (Istituto nazionale di statistica, Istat) showed that, of 100 workers on non-standard contracts in 2006, a year later only 16 workers had open-ended contracts, while 13 were registered as unemployed and eight were considered economically inactive. In France, it would seem that part-time and fixed-term working can be a stepping stone to more standard forms of employment, although the likelihood of this happening depends on age and decreases according to the time spent on these types of contract. For instance, studies have found that an individual under the age of 25 years has a 31.4% chance of moving into an open-ended employment relationship after one year of working on a fixed-term contract. This decreases to 12.6% in the case of an individual over the age of 40 years after two years of fixed-term working (European Community Household Panel (ECHP), average of 1994–2001). In Finland, only 10% of employees on fixed-term contracts believed that they would subsequently enter an open-ended employment relationship at their workplace. On the other hand, 42% thought that their fixed-term employment relationship would be continued and 21% did not know what would happen (Finnish Quality of Work Life Survey 2008). Regarding the transition from ‘very atypical’ employment to standard work, data from the Czech Republic showed that a shift occurred from short fixed-term contracts to longer contracts and open-ended contracts. It is thought that this reflects an employer’s tendency to employ individuals on a trial basis through short-term contracts before offering them a longer or open-ended contract – in a similar way to more formal probation contracts. Studies from Austria seem to confirm this point. Some studies have shown that employers tend to conclude fixed-term contracts with people who are entering the labour market (Kaupa et al, 2005). Furthermore, part-time work of fewer than 10 hours a week can be a stepping stone to labour market reintegration for women returning from parental leave in Austria. Nevertheless, some studies seem to indicate that it may be difficult for workers to move from very atypical forms of working towards the more standard labour market. In Ireland, although data are lacking, the general view is that it is difficult for individuals engaged in very atypical forms of working to make the transition to standard forms of employment – particularly in the case of seasonal workers and those working on zero hours contracts. Furthermore, beyond the formal labour market, data from Bulgaria reveal that it may be more difficult for individuals to exit informal employment than it is for them to leave unemployment: one study found that 72% of workers without a written contract had been in the same situation six years previously (Kolev, 2003). In some countries, the range of existing government-sponsored schemes that provide short part-time and short fixed-term contracts as a means of encouraging individuals to enter the labour market appear to have a limited effect. For example, in Germany, research evaluating the mini-jobs scheme found that these jobs are most often a ‘dead end’ and do not pave the way into standard forms of employment (Brandt, 2006). Overall, it is difficult to draw any definitive conclusions, given the variety of situations in which very atypical forms of work are used and the heterogeneity of the countries and studies outlined in this report. Nevertheless, it is also clearly difficult to find a systematic, positive pathway from ‘very atypical’ forms of work into more standard ones. When looking at the issue of non-standard employment in general, the viewpoints of the social partners and governments seem to differ. Furthermore, governments in Europe show adaptability to the social partners’ requests and to the economic context of the respective countries. Therefore, in one country, over a period to time, different and even opposite solutions, options and regulations may have been selected. In terms of the flexicurity debate, for example, some countries started to ‘flexibilise’ employment contractual arrangements following employers’ requests. However, after some years, various changes may have been considered – for instance, at the macro level, in the context of the national economic background – or new regulations may be introduced to address trade unions’ concerns regarding issues such as workers’ rights and protection. Governments, in general, tend to try to balance the views and requests of employers and trade unions on the issue of non-standard working, which can be relatively diverse. On the one hand, employers tend to ask for more flexibility, whereas trade unions on the other hand tend to demand stronger protection for vulnerable workers as well as restrictions on some forms of non-standard working. In some countries, governments try to favour specific solutions. In Italy, the debate has for some years revolved around the so-called ‘employer-coordinated freelance contracts’ (collaborazione coordinata e continuativa) and other types of non-standard working, largely boosted by legislation introduced in 2003. In the Czech Republic, the debate has in recent times centred on part-time work, with policymakers supporting the expansion of this form of work as a means of introducing more flexibility into the Czech labour market and economy. In Luxembourg, the government believes that employment law protection should be encouraged for all contractual relationships. Moreover, the government considers that open-ended contracts should remain the norm for employment contracts. In Malta, the government is promoting the concept of flexicurity, even though very atypical forms of working are relatively uncommon in this country. Trade unions are generally involved in the debate about non-standard employment and even very atypical forms of working. The unions focus on how to curb certain practices, and how to improve the rights of workers who they deem to be employed on precarious contracts. In Spain, the trade unions are active in the debate about how to encourage the development of open-ended contracts, as opposed to fixed-term contracts, which predominate in the country. The National Agreement on Collective Bargaining for 2007 (Acuerdo de Negociación Colectiva, ANC), was negotiated by representatives of the country’s trade unions, employers and government; the agreement contains provisions to promote employment stability and open-ended contracts (ES0702049I). Similarly, in Italy, the labour market has been opened up in recent years, and trade unions are engaged in the debate about adequate protection for workers on very atypical contracts. In the Czech Republic, where the debate centres on expanding part-time working, which is currently uncommon, trade unions are reluctant to support an expansion of part-time work; the unions believe that this form of working offers less protection for employees than full-time working, especially in a country where the social protection scheme does not perform efficiently. Flexicurity appears to be a central theme of the debate among trade unions in many countries. In Belgium, trade unions are trying to combat job insecurity in general, and are anxious about the EU debate on flexicurity, fearing that it could lead to increased levels of employment insecurity. The EU flexicurity debate is also prominent in Bulgaria, where employers are calling for greater flexibility and liberalisation of labour legislation, while trade unions remain opposed to this, insisting that the way forward is negotiated flexibility that respects employment rights and creates the conditions for a better work-life balance. In Spain, trade unions tend to accept flexicurity, provided that it exists within a framework of social rights, social protection and social dialogue. In countries which generally have fewer restrictions on the use of non-standard forms of work, trade unions focus their efforts on trying to ban forms of working that they consider ‘exploitative’, such as zero hours contracts. This is the case in Ireland, where even though the trade unions acknowledge the need for some forms of non-standard working, they would like the more insecure forms, such as zero hours contracts, to be curtailed. Trade unions in the UK are also active in trying to reduce the incidence of zero hours contracts in the retail sector. Perhaps somewhat exceptionally, in the Netherlands, where flexible working is common, trade unions view non-standard forms of working as a stepping stone to more standard forms of employment, within the framework of flexibility and security legislation. Nevertheless, the unions believe that the government should take action to make career trajectories more interesting, particularly for part-time female workers, in order to stop them from leaving the labour market prematurely.Moreover, trade unions in the Netherlands are also working to reduce the incidence of very precarious employment by trying to challenge instances where employees have been obliged to take on one or more part-time jobs after losing a full-time job. In some countries, such as Greece, the trade unions have been focusing their efforts on trying to improve monitoring and increase penalties for labour legislation violations. Finally, in some countries, different trade unions have varying opinions on how to address non-standard forms of work. For example, the views of trade unions in Portugal on non-standard forms of working tend to differ. In the case of very short fixed-term, non-written contracts for seasonal workers in agriculture and tourism, which the government wants to introduce, the Portuguese trade union UGT believes that adequate safeguards are in place to protect workers on this type of contract and therefore does not oppose it. However, the General Confederation of Portuguese Workers (Confederação Geral dos Trabalhadores Portugueses – Intersindical Nacional, CGTP-IN) is more cautious about these types of contracts. While recognising the need to ensure that non-standard workers are protected in terms of employment rights, employers generally aim to ensure that flexibility for employers is maintained. This usually involves employers’ opposition to any proposals to curb recourse to non-standard forms of working. For example, employer representatives in Greece generally promote the need for more flexibility in the labour market, although within the framework of procedures laid down in collective agreements. They are also in favour of simplifying procedures associated with the conclusion of part-time contracts and reducing bureaucracy for small and medium-sized enterprises (SMEs). The specific situation of employers in individual countries tends to depend on the context in which non-standard working operates. If there is tight regulation of non-standard working, employers tend to argue for a relaxation of regulation. For instance, employers in Belgium are concentrating on trying to extend and expand temporary working. It is also the main view of employer representatives in France that the French labour market is too tightly regulated and that the strict rules governing termination of contracts lead to employer reluctance to hire workers. The employers maintain that more flexibility would reduce unemployment. Similarly, employers in Latvia argue that regulation governing recruitment and dismissal is too tight and needs to be relaxed. In addition, Latvian employers are in favour of the adoption of legislation promoting new forms of employment, such as remote working and short fixed-term contracts. A slightly different view is presented in Luxembourg, by the main employer organisation, the Union of Luxembourg Enterprises (Union des Entreprises Luxembourgeoises, UEL), which would also like to see more non-standard forms of employment developed, although it believes that open-ended employment should remain the standard type of employment contract. In countries where there are fewer restrictions on non-standard working, such as Ireland, employers tend to make use of flexibility so that they can react to economic and labour market changes. Therefore, employers in Ireland resist any attempts to erode this flexibility. A common practice is to have a core workforce and use a periphery of non-permanent workers to meet fluctuations in demand. In the UK, where the regulatory framework is similar to that in Ireland, employers generally believe that non-standard working can be a positive choice for workers. They consider that, as long as these workers are not exploited, this type of working can provide a great deal of flexibility to allow people to balance their work and private lives. Interestingly, in the Czech Republic, employers do not support the government’s suggestion of increasing levels of part-time working. In their view, the operationalisation of non-standard workers is costly in terms of time and resources and, therefore, they consider full-time contracts to be more beneficial. In recent years, a range of actions have been undertaken by trade unions and policymakers to try to improve the rights of workers engaged in non-standard employment as a whole. Employers have undertaken fewer actions, in general, although many actions have been on a tripartite basis, involving employer representatives. Changes to the regulatory framework are underway in some countries, with a view to ensuring that workers in non-standard forms of employment are covered by appropriate employment rights and are protected from potential abuses. In Estonia, policymakers are reviewing the Employment Contracts Act (ECA), which is considered by the social partners to be out of date and in need of modernisation. In Bulgaria, actions have recently focused on amending the country’s Labour Code in order to limit the use of successive fixed-term contracts and to introduce more flexibility into the organisation of working time. New laws have also been developed in Spain in an effort to resolve problems such as the low labour force participation rate of women, high unemployment among young people, women and people with disabilities, and a high temporary employment rate. The focus of new legislation in this respect has therefore been on trying to promote open-ended and stable employment contracts, and on providing initiatives for employers to hire women, people with disabilities and groups at risk of social exclusion. In Finland, a range of new laws have been introduced over the past few years, designed to improve the situation of fixed-term employees, with legislation passed in 2001 (the Employment Contract Act reform), 2003 (on the reduction of the use of fixed-term contracts, particularly in the public sector) and 2005 (reform of the Act on Annual Holidays, which improves the rights of those on short fixed-term or short part-time contracts). New legislation improving the rights of part-time workers was also enacted in Malta in 2007. In Sweden, a revision of the Employment Protection Act in 2007 extended protection for temporary workers. By contrast, in France, recent legislation has focused on making the labour market more flexible by creating new types of fixed-term contracts and contracts under which employers can make workers redundant without needing to give a reason. In Germany, also, the legislative framework regarding temporary working has been relaxed significantly over the past six years; this has been accompanied by the introduction of mini-jobs, which are mostly marginal part-time jobs, designed to increase overall levels of employment at the lower end of the labour market. The Latvian government has also recently issued proposals aiming to introduce more flexibility into the labour market, primarily through expanding the use of fixed-term contracts. Implementation of legislation governing non-standard forms of employment is a challenge in some countries. In the Czech Republic, for example, the efforts of policymakers have been concentrated on improving implementation of the existing regulatory framework, in the context of generally low implementation levels and a lack of appropriate sanctions for breaches of the legislation. In Finland, the government set up a tripartite working group in 2006 to analyse the use of fixed-term employment, and this group issued a report in February 2007. The report made a range of recommendations – including the introduction of training for fixed-term employees, a pooling of good practices on how to reduce fixed-term employment and the introduction of new legislation to improve the monitoring of fixed-term employment. A range of actions has been undertaken by the trade unions with regard to non-standard work. In Austria, for instance, the Union of Salaried Employees, Graphical Workers and Journalists (Gewerkschaft der Privatangestellten, Druck, Journalismus, Papier, GPA-DJP) has set up a special interest group for atypical workers – known as ‘work@flex’. The group mainly focuses on so-called ‘new self-employed’ workers (neue Selbstständige), who hold a ‘contract for work’ (Werkvertrag) without a trade licence (Gewerbeschein), as well as individuals who have a ‘free service contract’ (freier Dienstvertrag). The aim of this group is to try to abolish contracts under which workers are hired on a freelance basis, even though the position they hold should really entitle them to a normal employment contract. In Belgium, trade union efforts have focused on trying to improve the quality of work in the case of non-standard working, and temporary agency work in particular. In other countries, such as the Czech Republic, trade union efforts have centred on opposing the use of successive fixed-term contracts. In recent years, German trade unions have concentrated their efforts on opposing mini-jobs by demanding that they be abolished. The unions believe that mini-jobs are taking the place of more standard forms of work, and are leading to a reduction in the overall level of social security coverage as well as an increase in labour market insecurity. Zero hours contracts are a focus for trade unions in the UK, with unions representing retail workers campaigning against zero hours contracts in this sector. The trade unions believe that these contracts can be exploitative, although employer organisations in the sector deny this. In the UK academic sector, the University and College Union (UCU) is campaigning against job insecurity in the form of fixed-term contracts for academic and research staff, and against hourly-paid contracts for teaching staff. In Sweden, one of the main areas of focus for the trade unions is on-call working. The latter has been criticised by the Swedish Confederation of Trade Unions (Landsorganisationen i Sverige, LO) and the Swedish Confederation of Professional Employees (Tjänstemännens Centralorganisation, TCO) as being an insecure form of employment. Moreover, the trade unions can, through general actions, touch upon issues specifically relevant to non-standard and even very atypical workers. In Cyprus, trade unions keep their members informed about health and safety matters, in addition to organising seminars to analyse risks arising in workplaces in an effort to prevent such risks. There are relatively few examples of employer representative actions in the area of non-standard forms of working, although some examples do exist of action taken in the form of bipartite and/or tripartite forums. For example, in Norway, both employer organisations and trade unions were appointed in the bipartite committee created in August 2001, to examine issues related to the revision of the country’s Working Environment Act (Arbeidsmiljøloven). The committee produced some final proposals in November 2004. In the area of non-standard forms of work, it focused on the restriction of use of temporary employment and the reduction of involuntary part-time work, by giving part-time workers the option of increasing their working hours, rather than encouraging employers to hire new employees. As mentioned in the introduction, this comparative analytical report aims to map the situation regarding ‘very atypical’ forms of work in the European Member States and Norway. This objective has been difficult to achieve as data are so diverse and not systematic. A systematic monitoring of the evolution of employment contractual arrangements is needed to better understand the trends and adequate actions foreseen. As very atypical forms of work are part of the more general category of ‘non-standard’ employment contracts, most of the analysis regarding the latter forms of work also applies to the former. Nevertheless, some specific aspects have been highlighted in the case of very atypical working. These particularities – some of which are summarised in the following sections – should be kept in mind by policymakers seeking to regulate and monitor the use of specific non-standard contractual arrangements, such as very short fixed-term work (fewer than six months), very short part-time contracts (fewer than 10 hours a week), no-contract and zero hours or on-call work. The types of workers engaged in very atypical forms of work tend to be extremely heterogeneous, ranging from very low-skilled workers on seasonal contracts to highly-skilled professionals on short, task-focused contracts, whose experience of their work situation will be radically different from that of workers in the former category. Depending on individual circumstances, some workers could at one period of time find that certain ‘very atypical’ employment contracts meet their own needs or time constraints – such as caring for children or elderly persons, or engaging in initial training. On the other hand, workers may be ‘trapped’ in these forms of work, due to the lack of skills developments, job proposals, mobility or other alternatives – as it is the case for some migrant workers. In addition, a high degree of variety is evident in Europe in the use of each type of ‘very atypical’ contract, mostly depending on the national economic background of the respective countries. Nevertheless, some specificity seems to be visible with regard to sectoral characteristics. For instance, seasonal working, which involves short fixed-term contracts, is prevalent in sectors such as agriculture, or tourism and hotels. On the other hand, zero hours working tends to be common in the retail sector and in some parts of the public and care sectors. The level of variety regarding very atypical employment is one of the main difficulties facing policymakers. The situation is even more challenging today, as the whole labour market is mixed, encompassing workers engaged in standard and non-standard forms of employment who are doing the same work or responding to same job profile, in one sector, one company or even at the same workplace. Given the main characteristics of ‘very atypical’ contractual arrangements – including their transient nature – it is extremely difficult for trade unions to act according to traditional routes. For instance, workers engaged in this type of work are difficult to contact as they work short hours or are not systematically on site; moreover, workers may not be interested in services not applying to them, as there will be no career path, training or professional development for them in the company. At the same time, trade unions and standard workers have to overcome reservations against ‘outsiders’, who are sometimes seen as competitors. In addition, workers’ rights and social protection are still not easily applicable to ‘very atypical’ workers. Even if very atypical forms of work could be sometimes used by both employers and workers to cater for their own interests, in the long term these contractual arrangements seem to constitute a ‘lose-lose’ situation: workers neither have the guarantee of income nor job security; employers have to re-invest, each time, in newly hired workers without getting any real commitment in return. Coordinated actions, either tripartite or bipartite, have proven to yield some results. In particular, taking the opportunity to understand the evolution of work in a sector seems to be a good basis from which to jointly devise the necessary responses and address the needs of both workers and employers. Given the transient nature of very atypical forms of work, the impacts on health are not so easy to determine. Nevertheless, there are some specific issues that tend to affect workers engaged in non-standard forms of work, and even more so those on very atypical contractual arrangements. Firstly, workers on these types of contracts tend to be more exposed to certain risks and work-related accidents, given the type of jobs and sectors in which they perform their work. Secondly, there is a higher risk of mental stress due to the uncertainty of the situation of workers on very atypical contracts – largely arising from the lack of visibility regarding the future. Finally, although non-standard workers are theoretically covered by the same health and safety provisions and complaints procedures as other workers, differences are reported in the health and safety outcomes for these workers. All of these elements underline the need for preventive actions regarding the health and safety of these workers, particularly as the employment duration of very atypical work does not generally allow sufficient time for such measures to act efficiently during the work period. Such efforts should raise awareness among all the parties involved – that is, employers, workers, trade unions and policymakers – about the importance of health and safety for workers engaged in very atypical forms of employment. In general, very atypical forms of work tend to be associated with low-paid jobs, which are performed by low-skilled workers. The low income potential is of particular concern here, given that the link between working in very atypical employment and living in a household at risk of poverty is stronger than it is for workers on standard contracts. Policymakers should not forget that the problem of undeclared work is an associated issue in many countries. Although this report does not focus on this issue in any detail, it is clear that the informal economy is at the very edge of non-standard forms of work (see Figure 1). Governments in some countries are trying to tackle this phenomenon, as undeclared work has a significant impact on the formal economy. Real flexicurity policies – combining the flexibility of contractual arrangements with the security of workers’ rights and protection – could be a possible way forward. In this respect, the social partners have a critical role to play in assessing and devising the right degree needed for each side of the flexicurity coin. Aronsson, G., Dallner, M., Lindh, T. and Göransson, S., ‘Flexible pay but fixed expenses: Personal financial strain among on-call employees’, in International Journal of Health Services, Vol. 35, No. 3, 2005, pp. 499–528, available online at: http://baywood.metapress.com/openurl.asp?genre=article&eissn=1541-4469&volume=35&issue=3&spage=499. Bardasi, E. and Francesconi, M., The impact of atypical employment on individual well-being: Evidence from a panel of British workers, Colchester, Institute of Social and Economic Research, University of Essex, 2003. Berndt, E., Die Bedeutung der teilzeit- und geringfügigen beschäftigung für die Vorarlberger arbeitnehmer [The importance of part-time and marginal employment for employees in Vorarlberg], Results of a representative employee survey commissioned by the Chamber of Labour of the Vorarlberg region, May 2006. Brandt, T., ‘Bilanz der mini-jobs und reformperspektiven’, in WSI-Mitteilungen, No. 8, Düsseldorf, 2006, pp. 446–452. Bredgaard, T., Larsen, F., Madsen, P.K, Rasmussen, S., Flexicurity and atypical employment in Denmark, CARMA Research Paper, 2009. Dunstan, R. and Anderson, D., Vulnerable workers: Preliminary findings from the citizens advice client research, Employment Relations Occasional Paper, London, BERR, 2008, available online at: http://www.berr.gov.uk/files/file44089.pdf. Edwards, P., Non-standard work and labour market restructuring in the UK, Paper for Associazione Nuovi Lavori conference on ‘The latest in the labour market’, Industrial Relations Research Unit (IRRU), University of Warwick, 2006, available online at: http://www2.warwick.ac.uk/fac/soc/wbs/research/irru/publications/recentconf/pe_rome.pdf. European Commission, Modernising labour law to meet the challenges of the 21st century, Green Paper, COM(2006) 708 final, Brussels, 22 November 2006, available online at: http://europa.eu/legislation_summaries/employment_and_social_policy/growth_and_jobs/c10312_en.htm. European Commission, Towards common principles of flexicurity: More and better jobs through flexibility and security, COM(2007) 359 final, Brussels, June 2007, available online at: http://eur-lex.europa.eu/LexUriServ/LexUriServ.do?uri=COM:2007:0359:FIN:EN:PDF. Eurofound, Quality of work and employment, Foundation paper no 1, February 2002, Luxembourg, Publications Office, 2002. Institute for the Development of Vocational Training (Isfol), La qualità del lavoro in Italia. Seconda indagine [Quality of work in Italy. Second survey], Rome, Isfol, 2007, available online at: http://www.isfol.it/DocEditor/test/File/La qualità del lavoro in Italia_seconda indagine.pdf. Kaupa, I., Kien, C., Kreiml, T., Riesenfelder, A., Steiner, K., Weber, M. and Wetzel, P., Zufriedenheit, Einkommenssituation und Berufsperspektiven bei Neuen Erwerbsformen in Wien [Satisfaction, income situation and occupational perspectives of new forms of employment in Vienna], A study commissioned by the Vienna Municipal Department MA 27 (EU Strategy and Economic Development) in cooperation with the Vienna Employment Promotion Fund (WAFF), Vienna, December 2005, available online at: http://www.lrsocialresearch.at/files/Neue_Erwerbsformen_Wien_Endbericht_(32)_BAND_1.pdf. Klein Hesselink, J., Kooij-de Bode, H. and Koppenrade, V., Wie zijn de overige flexwerkers en hoe gaan zijn om met het risico van ziekte, Hoofddorp, TNO Work and Employment, 2008. Kolev, A., Joblessness and precarious work in Bulgaria: Addressing the multiple aspects of vulnerability in the labour market, Discussion Paper No. 0303, Washington DC, World Bank Social Protection Unit, 2003, available online at: http://siteresources.worldbank.org/SOCIALPROTECTION/Resources/SP-Discussion-papers/Labor-Market-DP/0303.pdf. Lyly-Yrjänäinen, M., European Foundation for the Improvement of Living and Working Conditions (Eurofound), Who needs up-skilling? Low-skilled and low-qualified workers in the European Union, Dublin, 2008, available online at: /ef/publications/report/2008/undefined/who-needs-up-skilling-low-skilled-and-low-qualified-workers-in-the-european-union. Nienhueser, W., ‘Flexible work = atypical work = precarious work?’, Management Revue, Vol. 16, Issue 3, Mering, Rainer Hampp Verlag, 2005, available online at: http://www.management-revue.org/papers/mrev_3_05_Nienhueser_Editorial.pdf. Organisation for Economic Co-operation and Development (OECD), ‘Taking the measure of temporary employment’, Employment Outlook 2002, Paris, OECD, 2002, available online at: http://www.oecd.org/dataoecd/36/8/17652675.pdf. Pederson, H., Hansen, C. and Mahler, S., Eurofound, Temporary agency work in the European Union, Dublin, 2004, available online at: /ef/observatories/eurwork/articles/labour-market-undefined/temporary-agency-work-in-the-european-union. Riso, S., Eurofound, Very atypical work: exploratory analysis of the fourth European Working Conditions Survey, Dublin, 2010, available online at: /ef/publications/report/2010/undefined/very-atypical-work-exploratory-analysis-of-fourth-european-working-conditions-survey-background. Robolis, S. and Targoutzidis, A., ‘Occupational risk in flexible forms of employment in Greece’, Safety Science, 2009 (forthcoming). Sels, L., Vandersteene, T., Van Hootegem, G., De Witte, H. and Forrier, A., Op zoek naar een balans tussen flexibiliteit en zekerheid, Higher Institute for Labour Studies (HIVA), Catholic University of Leuven (KUL), 2002, available online at: http://www.werk.be/assets/werk.be/cijfers-en-onderzoek/onderzoek/onderzoeksprojecten/1994_2006/VIONA_98_RPT_Impact_van_Institutionele_Context_samenvatting.pdf. Trades Union Congress (TUC), Hard work, hidden lives, Full report of the TUC Commission on Vulnerable Employment, London, TUC, 2008, available online at: http://www.vulnerableworkers.org.uk/files/CoVE_full_report.pdf. Vendramin; P.; Le travail Atypique: Résultats d’enquête, Fondation Travail-Université, Service Syndical des femmes de al CSC, 2001. Verhofstadt, E., Qualitative aspects of entry jobs, Dissertation, Ghent, Ghent University, April 2007. Wallette, M., Temporary jobs in Sweden: Incidence, exit and on-the-job training, Lund Economic Studies No. 120, Department of Economics, Lund University, 2004. Wilthagen, T. and Tros, F., The concept of ‘flexicurity’: A new approach to regulating employment and labour markets, Transfer, European Review of Labour and Research, 10, no. 2 (Summer), 166-186, 2004. Note: A list of country codes and their corresponding country names is shown in Annex 2 below.